The water was cold. Not as cold as I expected, but I didn’t have time to consider what to expect. I didn’t have time to think of the cold. I was focused on trying to get out of my overturned kayak in the rushing river. The water looked hazy as I wide-eyed, looked and struggled. Mouth open, I swallowed water. The far recesses of my brain registered thoughts of breathing in water and drowning. The force of the water was strong as I tried to get my head up for a breath. After what felt like forever, my spray skirt released and I popped up, grabbing the kayak, thinking I must stay with the boat. I screamed loud to get Diane and Bev’s attention. I heard Bev blow her whistle and I grabbed mine and blew. The whistle did not blow as loudly as advertised on the Amazon site where I’d ordered it: I did not have the breath. I started kicking, trying to urge the overturned kayak toward the shore but being driven downstream by the power of the water. I wondered when hypothermia would set in and I would let go of the kayak and sink. That was not happening, though, and I finally figured out that I could turn the kayak upright. I pulled myself onto the hull, grabbing the cockpit rim on the opposite side, using my weight to release the boat from the water. It slowly came around and popped up. It was easier than I expected and then I was able to kick toward shore. Bit by bit I made headway. Finally I could feel rocks under my feet but could not gain purchase in the rushing water. Then, closer to shore, I was able to maintain contact with the rocks to keep pushing and pulling. My ball cap fell off and I grabbed it. Only later did I realize that I had lost a favorite beanie I was wearing over the ball cap. Only later did I realize I lost my water bottle and map. Those were not in my thoughts as I crawled toward shore then stood, pulled the kayak to gravel, then bent over, hands on knees breathing hard. Diane and Bev got to me, helped pull and tip the kayak. I grabbed my camera, found the ‘dry’ bag was not really a dry bag and pulled out the camera. Shaking uncontrollably, I looked up and saw a house. “Let’s go up and see if anyone is there.” We grabbed my dry clothes and headed up. We were lucky. So lucky. The woman was in her Suburban just pulling out. She was understandably surprised to see us. She drove up to get her husband and they both returned to the house, opened their home, started a fire, gave me a towel and threw my clothes into the dryer. I shivered uncontrollably as I sat a few inches from their fireplace, drinking hot water. Vicki and Glen were our river angels; even serving us hot apple pie with ice cream. Those calories gave me the energy to warm up a bit more. The last thing I wanted to do was to climb back into the kayak, yet that is what we needed to do. Five miles later we pulled out at Reed Point after only a few more rapids. 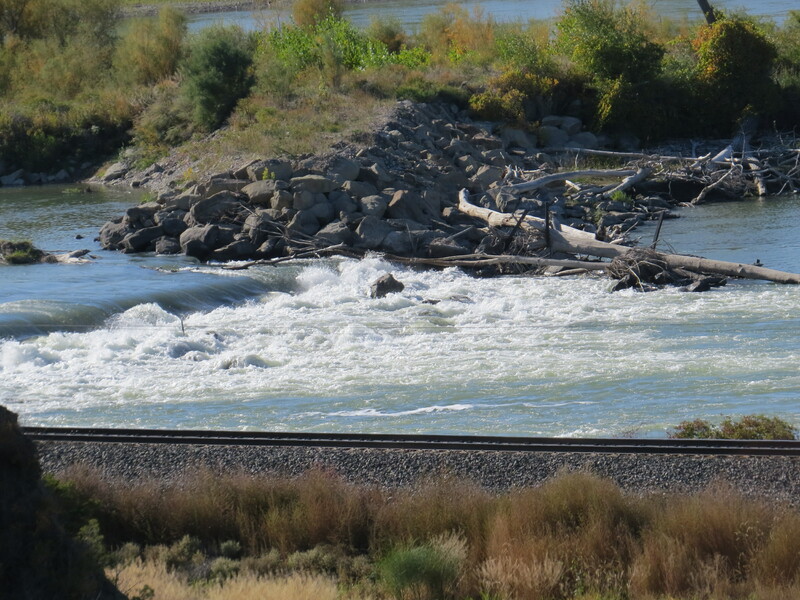 The Yellowstone River, at least from Livingston through Billings, is technical water. There is no relaxation, no opportunity to just sit and look for more than a minute or two at a time. Concentration is required to determine which braid looks best, to try to avoid the largest rapids, and when in them, to keep the boat straight and upright. We had some huge waves; one broke over my shoulders, another over my head. But it was not the wave that sent me for a swim. It was a tree with a pile of brush stuck on a curve. The water brought me right into it. The kayak moved along the edge and I thought I was free when suddenly the boat caught on a submerged branch. I can barely think about it even now. I learned that things happen fast, that all good can go to all bad in the blink of an eye. After an evening of burger and beer at a Reed Point bar, we crawled into our tents and woke to heavy frost. Diane and I packed up and got on the river for another 20 miles to Columbus while Bev ran an errand. One final huge wave and Diane and I arrived at the take out. The day had been windy with a front of even colder weather moving in. After much discussion, we got off the river for a few days to wait out the snow. 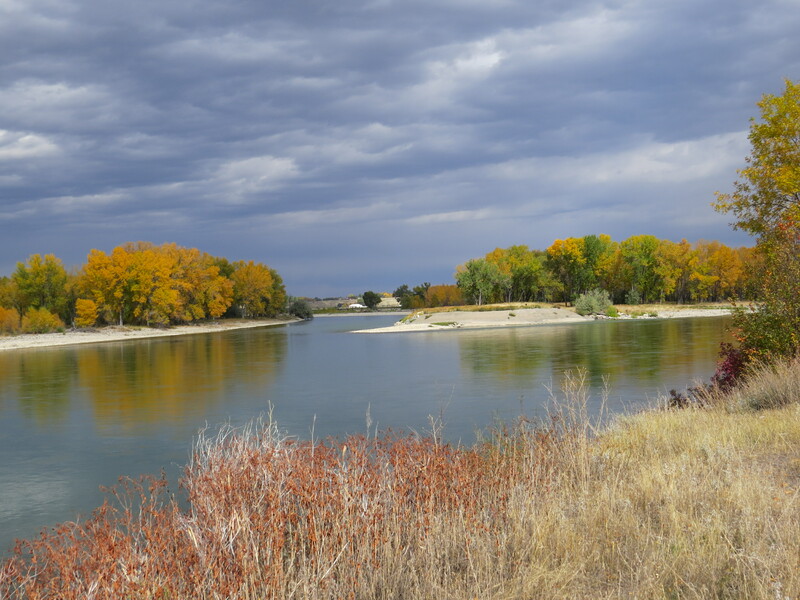 There are two more chapters to this year’s attempt to kayak the Yellowstone River: a few days paddling further down the river from Pompey’s Pillar to Hysham, then a road trip to the confluence of the Missouri and Yellowstone Rivers. Though the river widened and calmed, those second few days on the river raised my anxiety level to an unmanageable degree. Though I got back on the horse, I could not control my fears. I realize that I need time. Time to process the experience. Time to practice more flipping in warm weather and calmer conditions. Time to regain confidence. I still struggle with the decision to get off the river. But next year…. We are looking forward to next year on the river again. Wiser, better prepared with warmer clothing (at least for me), and more safety equipment. I read something recently that resonated with this past month’s experiences: our decisions make us who we are. 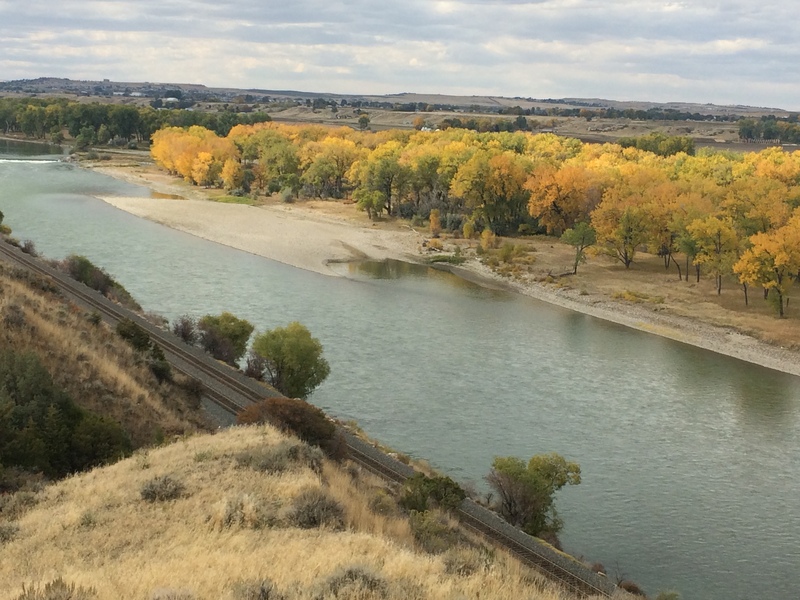 The decision to paddle the Yellowstone River has made me vulnerable yet in that vulnerability lies strength. A very good story, one that brings a paradox to mind. I often think of nature in terms of a delicate balance but she can humble us with her power. I am glad you are OK. Thanks, Mike. I feel like I learned a lifetime in a few short days. 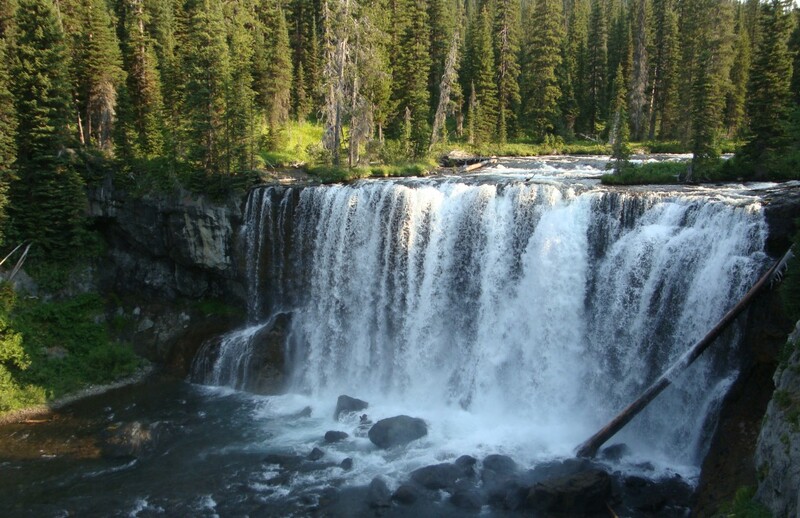 The Yellowstone Rivetr is most definitely humbling… its power provokes awe. For your own safety, whilst kayaking, you should learn to do the ‘eskimo roll’, best practised under controlled conditions in a swimming pool. It took me a year to become proficient at it, but worthwhile, as many kayaks are designed for a tight body fit, with some very difficult to extricate from without nasty scrapes to your shin bones! Best wishes for your future adventures. Thanks for your concern and advice. I have doubts of my ability to eskimo roll a fully loaded sea kayak in a fast moving river, but I do plan to practice wet exits before returning to the river. I’d like to find an actual class in the area. Thanks, Teresa. Thankfully, I did not lose my favorite lightweight MH hat!! In fact, I’ve been wearing that each morning this month! I was very happy not to have had that hat on that day…. But of course now I am in the market for another hat, a warmer one. Wow, what a harrowing experience Julianne. But what I love about you is your perspective, your ability to step back, reflect deeply on your experience, and determine the best way to move forward. You are a wonderful role model for all of us to embrace. So happy that you are ok. Thank you, LuAnn. You are very kind. The experience did set me back but I plan to work on flipping skills. And with warmer clothing my teeth won’t be chattering for hours each day. As we are traveling now, every time we parallel a river, I am focused on the water, thinking about how I would paddle that stretch. Great idea Julianne. I love your ability to overcome obstacles. Again I have to say, you are a great role model. LuAnn left me little to say…ditto! Dry hugs!